If you’ve been dancing for a while, you probably already know the basic tutu cuts. The romantic style is easy to spot because of its ankle or below-the-knee length in voluminous layers of soft net and tulle. The classical tutu usually refers to the pancake or platter style with its flattened shape that is hooped to stay straight out from the hip. 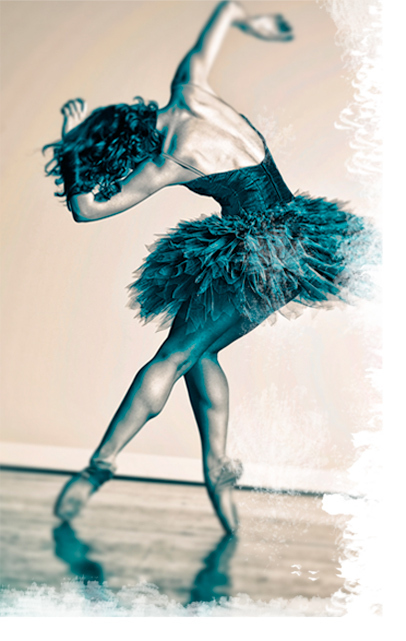 There are three common subcategories of the classical tutu. The original is the pancake described above. The Balanchine or Karinska tutu, also called a powderpuff, is obvious from its loosely tacked softer tulle or net that is shorter in length than the pancake and not hooped. The bell tutu is similar to the pancake, but bells slightly downward with no hoop and has more layers than a pancake style. Practice or rehearsal versions are available in all the styles above, but are most common for pancake tutus. If you are purchasing a rehearsal tutu of any kind, it is best to spend more if you can to get a professional version because that will give you the versatility to alter it into a performance piece. Most professional tutu-makers make practice versions based on the same construction as their performance versions. Ordering from one of them is the easiest way to ensure you have a tutu you can use for practice and potentially for performance. This will require some careful measuring with the help of a friend and some patience for the creation of your tutu. Each maker can tell you the specifics of their ordering process and often has a page on their website devoted to this information. Practice tutus are most versatile in white but much easier to keep clean-looking in black. Cleaning any tutu can be a difficult process. Chemical dry cleaning destroys their delicate frills, hoops can rust in water, and the delicate decorations and beading can be harmed by any cleaning method. Foregoing an overall cleaning in favor of spot cleaning and deordorizer (think Febreze) can be a good solution, though sweat and grime may eventually break down the fabric. Ideally, design the tutu as best you can so that embellishments can be removed for cleaning. This makes it much more versatile anyway. If you need to go a less expensive route, there are some decent options out there. You’ve may have noticed that most discount dance suppliers have tutu sections, and those can be great resources. Try not to buy really cheap and ill-made tutus; that’s just throwing away money. Even if you can’t afford a pro-made tutu, you should still look for something with good quality tulle and a corset basque. Some decent practice tutus are made by Bloch, Star Styled, Body Wrappers, Main Street Dancewear, Sansha, Algy Performs, Wear Moi and Mondor. A few also sell bodice-style leotards that can be matched to the tutu for a very simple performance piece. Most of these styles are available through discount dancewear retailers. Once you have your prized tutu, you should keep it in primo condition by storing it a proper tutu bag to protect it from crushing. Tutus should never be folded, but if you must, picking it up from the crotch and gently folding it upside down can minimize damage. If you pack it right-side-up, your tutu will flatten and the look will be ruined. Hanging tutus should be upside-down as well. Pancake tutus can be stored flat on a shelf provided they are not stacked one top of the other so that air can circulate.